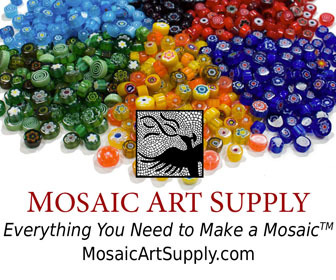 To make detailed mosaic images using whole uncut tile, you need to use a tiny brand, such as the 8mm Recycled Glass Mosaic Tile by Morjo™ that we sell. You also need to make sure the image is large enough to accommodate the level of detail. 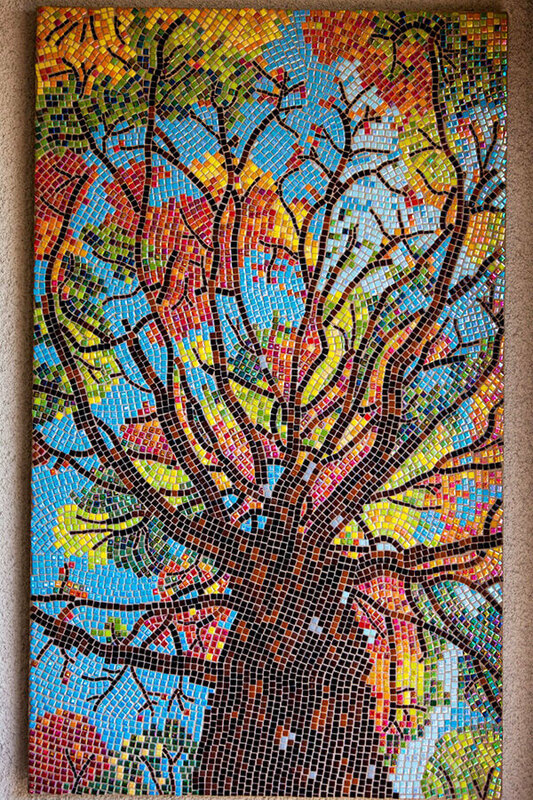 The Tree Mosaic recently completed by artist Robert Friedlander is good example of the relationships between the size of the tile, the size of the details to be rendered, and the size of the image as a whole. It made me very happy when Robert told me that the mosaic was made with our new Morjo brand., but I was even more excited by how successful the project was in terms of contrast and visual impact and it being a good teaching example of how to use rows of whole tile without a rigid grid. Most pictures need to simplified in order to be rendered in tile. To determine how big to make your mosaic, try drawing the smallest detail you would like to render, and then practice arranging tile on the drawing to render the detail. Some unfortunate novices do just the opposite: They start gluing on background tiles and then work toward the figure in the center only to discover that the mosaic is too small for them to render the faces or other figures in sufficient detail. I wrote this article about resizing mosaic patterns using only a ruler. 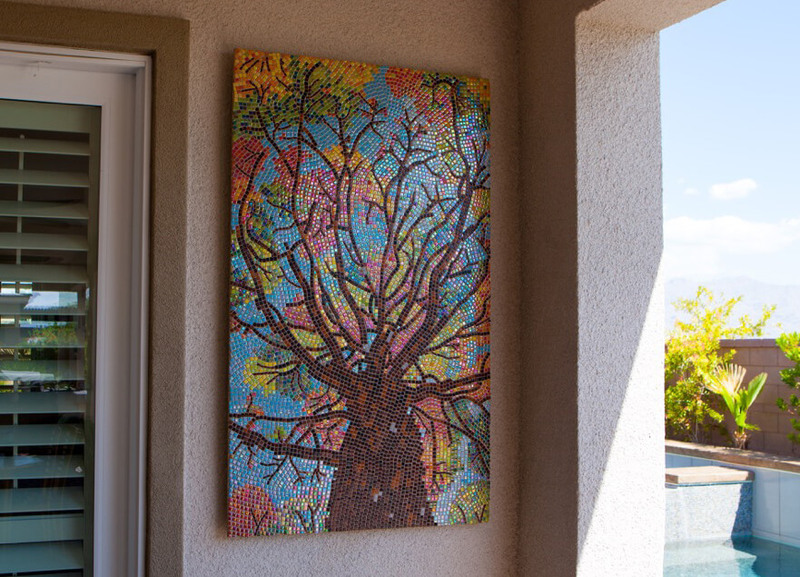 Tree Mosaic Art Robert Friedlander Installed on Porch. Notice how most tiles are whole 8mm tiles, possibly over 95% of them. Cut tiles are used in only a few places where rows of tile come to an end. Also notice how the artist used rows of tile but not a grid. You do not have to use a grid in order to use whole tiles (or mostly whole tiles). This mosaic is also a great example of the power of color contrast. The cool blue sky fades to the back while the warm tones of the bark and leaves jump forward. Robert did good with this one. Even though this mosaic was installed underneath a porch which looks large enough to shelter it from rain, plywood would still NOT be the best choice of backer. Plywood can warp slightly due to daily cycles in humidity, and even slight warping can cause tiles to pop off. This happens surprisingly quickly unless you live in a desert. I wrote and article about materials for outdoor mosaic tables that explains why plywood is problematic outdoors, what you can do to help it last longer, and why you are much better off using some of the alternatives we recommend. This entry was posted in Art Review, Improving Your Art and tagged andamento, contemporary mosaic, design considerations on September 29, 2017 by Joe Moorman. I would be interested in feedback on this piece. I used 8mm and 1cm tiles along with fused baubles and cut glass. What I am disappointed about is the bottom left corner. The idea was that the purple was trying to burst out of the brown. Perhaps I should have used 2 different coloured grouts? Please email us a picture, and we will take a look.